Humour is definitely a funny subject, and one that is very personal to the individual. One person can be found rolling around the floor in hysterical laughter, while another person, seeing or hearing the same thing is left totally unmoved. I like a good laugh though don't you? I'm not the laugh out loud sort of person; more the quiet inward chuckle, but I enjoy it just as much as the person who's laughter volume is turned up to 10. Television and radio laughter can be real escapism, and be the antidote to all of the serious things that happen in life - at least for a little while. The other day I was walking past a charity shop in town, and noticed in the window a copy of the book "The Last Hancock Scripts", priced at £3.98. I couldn't resist, and I bought it. It started me thinking about my favourite radio and TV comedies. I had fun in my mind going back to the 1950's, and I realised that there is little that I really enjoy today, and that my love affair with comedy is steeped in my history. Don't get me wrong, there are individuals today that I enjoy listening to and watching, but most, in my opinion, don't compare with the greats of the past. I decided to try and come up with five of my funniest favourites on television and radio. I'll mention them in roughly chronological order. In 1951 an explosive event happened on British radio; a new comedy show burst on to the airwaves, called The Goon Show. It was mostly written by and starred Spike Milligan, ably supported by Harry Seacombe and Peter Sellers, with Michael Bentine involved right at the beginning. It was maniacal with its funny characters, funny voices, funny scenes and funny noises. It was a revolution in British radio comedy. From 1951 to 1960, there were ten series of the show, roughly one a year, and a total of 223 episodes. Spike Milligan was involved in writing most of them, which when you think about it, was on average writing and performing in one show every two weeks for ten years. 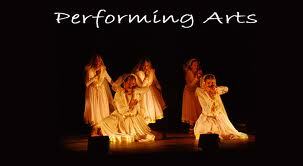 I loved that show and I still do, even 60 years after it was first performed. I have about 80 of the shows on old cassette tapes, and they are as fresh as they have ever been. Also in the 1950's, to be exact 1954, what is now called a "situation comedy" was aired on BBC radio. It was called "Hancock's Half Hour", starring Tony Hancock. 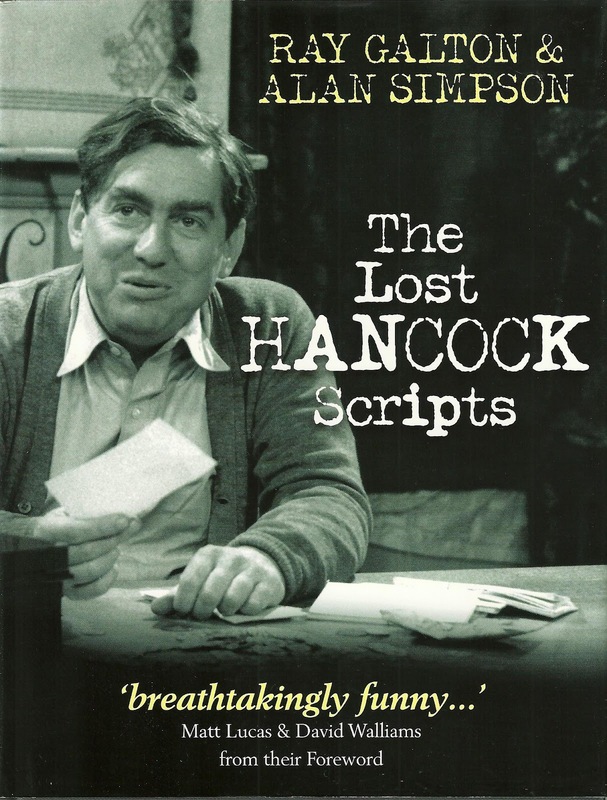 It was brilliant writing and performance that followed the life and views of one Anthony Hancock, a Londoner from East Cheam (though he did live elsewhere in some episodes). The radio series ran from 1954 until 1959: a total of 6 series covering 102 episodes. Hancock's Half Hour was one of the few programmes that have been hugely successful on radio, and also when it was transferred to television. While it was still being broadcast on radio, the television series began in 1956, and ran until 1961. There were 63 episodes over 7 series, and history records phenomenal viewing figures at the time. The final series, series 7 broadcast in 1961 was simply called Hancock, because the programme's length had been reduced from 30 to 25 minutes. Series 7 was responsible for some of the best known of all Hancock's programmes. I've tried to refresh my memory over the episode called "The Lift", where I believe that Tony Hancock starred alone, and was trapped in a lift. It was a masterpiece. Two other episodes in this last series were "The Radio Ham" - and who can forget the immortal line, "It is ah not raining in Tokyo", and perhaps the classic of all in "The Blood Donor". I'm laughing to myself as I'm writing this. My first comedy LP had The Blood Donor on one side and The Radio Ham on the other. I can still hear Hancock as he's looking at hospital posters sing, to the tune of the German National Anthem, "Coughs and sneezes spreads diseases". And who can ever forget, "Rhesus, they're monkey's aren't they?". "A pint? that's very nearly an armful". What a tragedy that as far as I can research, only 37 of the original 63 television scripts exist today. Tony Hancock may have committed suicide in far away Australia, alone and troubled, but what laughter he brought to millions. 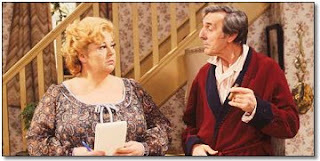 Eric Sykes and Hattie Jacques in 1960 starred in a comedy sit-com called "Sykes and A ..." with the object that was to cause havoc in their lives inserted in the title. (eg "Sykes and A Plank", which incidently was so popular that a silent film was later made called "The Plank" starring Eric Sykes and Tommy Cooper - it was wonderful). Eric and Hattie played brother and sister with various mishaps occurring in their lives. The programme ran for 60 episodes until 1965. It returned in 1972 under the title "Sykes", and ran for a further 68 episodes until 1979. It was extremely popular, and would probably have gone on longer, but for the sudden death of Hattie Jacques in 1980. I loved it, and it is best summed up by one TV reviewer who wrote, "Simple, yet richly observed and consummately performed, both series successfully managed to maintain a winning 'child-like' innocence in its central characters that endeared both it, and its core group of actors to the entire nation". In 1975 we were treated to the first sight of a maniacal Torquay hotel proprietor played by John Cleese in "Fawlty Towers". That year, five more episodes followed, with a further six in 1979. A total of only 12 episodes of what became a classic series, which is still revered today. I have them all on DVD, and I love them as much as I did when I first watched them, and they still make me laugh. Finally, something from America, that had an even shorter run than Fawlty Towers; it is Police Squad! starring Leslie Neilson. You really need to have seen this to appreciated it as its non stop visual and verbal gags, delivered dead pan had me in stitches. It spawned the later Naked Gun series of films. It was shown on the American TV network ABC in 1982, and after four episodes had been aired in March, ABC announced its cancellation. The final two episodes were broadcast in the Summer of 1982. A total of six episodes for one of the funniest and creative of TV programmes. Why so few? The reason for cancellation has become almost as famous as the series itself. The then ABC entertainment president said, "Police Squad! was cancelled because the viewer had to watch it in order to appreciate it". This has been interpreted as meaning that the viewer had to actually pay close attention to the show in order to get much out of the humour, while most other TV shows did not demand as much effort from the viewer. You can still watch episodes on YouTube, and I adored the visual and quick-fire jokes. I'll not say which of the above is my favourite, as it changes from time to time, and they are all masters at making people laugh. We'll all have a different list, but the important thing is to place the need for laughter high up on our list of priorities. Enjoy. The 1st March 2012 was 'World Book day', and something special was happening in West Bridgford. 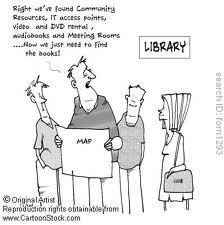 We were going to get an improved library. My eldest son started his library career stamping books behind the counter, and has now reached the prestigious position of Director of Senate House Libraries at the University of London. In his view, (which is also the view of others who have been in library services for a long time) they have always had to live with the question of the future of libraries, and their potential imminent demise. There are certainly many articles on-line which over the past twenty years have been discussing these matters. But like Mark Twain, after hearing that his obituary had been published in the New York Journal, libraries could say that, "The reports of my death are greatly exaggerated". Nottinghamshire County Council is one of the largest education authorities in the country, and in addition to supporting 358 schools, it runs over 60 libraries as well as seven mobile libraries. In the Borough of Rushcliffe, there are nine key libraries, of which one is the West Bridgford Library. Work has started on a major £5.3 million re-development programme, which by the Spring of 2013 will see a vastly improved library service, and a brand new young people's centre. It was on the 1st March 2012 that the turf-cutting ceremony took place. 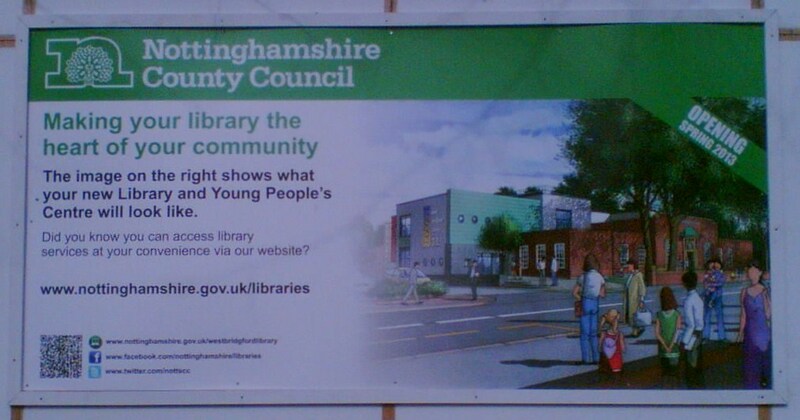 According to the County Council's web site, "The flagship West Bridgford library development is the latest in the county council's plan to continue to invest, develop and remodel its existing libraries to be able to continue to serve traditional library users and meet the demand for digital services and reach out to new audiences". There is sound judgement here in recognising that traditional users are important; that digital services are part of the present, and that libraries will only flourish in the future if they attract new audiences. The current library building was built in 1938 or 1939 (depending on who you read), which makes it contemporary with The Test Match pub. (Irrelevant I know, but it's my local, so it's worth a mention). I was so pleased to see that the new service will retain the original building, while having a brand new, modern young people's centre built on the back of it. From the sketches that are available, the two designs seem to fit well together. Too many fine historic buildings have been lost in Nottingham over the years, so it is a tribute to the county planners that they have kept this fine 1930's building. If I sound like Prince Charles I don't care; I believe it. In reading blog comments elsewhere, some people seem to be afraid that new library space will be taken up with children's areas, DVD's, CD's and computers, leaving less space for actual physical books. If this was the case, I too would be concerned. However, at West Bridgford we are promised "two floors filled with books". Yes there will also be a dedicated children's area as well as increased "free use of computers, internet and wi-fi". In addition there will be a new Shopmobility service, and the Registrar's Office will move from Bridgford Hall into the building. In keeping with the requirements of the Disability Discrimination Act, the whole building will be fully accessible. I like the sound of it, and it will bring people in through the doors for a range of reasons, which will help to legitimise its presence. Throughput (or footfall) is everything, and it is not inconceivable to think of people coming in for Shopmobility or the Registrar, who also find themselves viewing the books. The strapline for Rushcliffe Borough Council is, "Great Place - Great Lifestyle - Great Sport". While this may border on hyperbole, the new young people's centre will be a great place for West Bridgford's creative young people to develop and showcase their talents. I've been critical of Council in the past, and I stand by that, but credit where credit is due. The re-developed site on Bridgford Road is very exciting, and shows that there's life in the library yet. It's down to us residents to make sure that we use it. I for one have my library card at the ready. Just when you began to think that ideas couldn't get any barmier, along comes health commissioners in Rushcliffe. It seems that NHS patients will no longer get hands-on treatment, but will simply be given "advice and guidance". The aim, according to health commissioners is to help patients to "self manage their condition ... and to take control of their condition and get better quicker". Let's have a look at the background here. In the Government's Health and Social Care Bill, Clinical Commissioning Groups will take over from all Primary Care Trusts in April 2013. Nottinghamshire is ahead of the Government's timetable, and has already devolved budgets to new groups. In the Borough of Rushcliffe, which is where I live, the new clinical commissioning group is called Principia, and is responsible for planning and buying healthcare services in the Borough. This group are responsible for the no-touching rule for physiotherapy. A spokesperson said that the change in service had not been a cost-cutting measure, and that "costs were broadly the same as before". Now call me cynical if you like, but I don't believe it, and what the hell does "broadly the same" mean anyway? Today's Nottingham Post says, "For many patients suffering from chronic back, neck or joint pain, physiotherapy is an essential step on the road to recovery". Statistically, 80% of the population suffer from lower back pain at some stage in their lives, which if applied to Rushcliffe gives a figure of over 96,000 patients. Previously under the NHS in Rushcliffe, if you had problems, you were offered one assessment and up to four treatments for physiotherapy. The clinical commissioning group has reviewed its services, and changed from being a treatment service to an advice and guidance service. As the Post says, "This means the physiotherapists are no longer allowed to touch patients, and instead give advice on what exercises they should be doing and information on how to manage their condition themselves". Even before you can get a referral to a physiotherapist, you have to visit your GP on two occasions, six weeks apart. If you can navigate that hurdle, all patients in Rushcliffe can expect is a maximum of two physiotherapy appointments a year, and that for advice and guidance. Following a survey of all Primary Care Trusts in the country, The Chartered Society of Physiotherapy has said that Principia was the only group not to offer a hands-on treatment to physiotherapy patients. Commenting on the new service, the Society's Chief Executive said, "They seem to have invented a new form of physiotherapy that no one has heard of - do-not-touch physiotherapy". Patient's group are equally concerned about the new service. A spokesperson for the Local Improvement Network in Nottinghamshire said, "I think it is just awful. If you need physiotherapy, you need the treatment, not just advice". As someone who suffers from back pain, and has benefited over the years from physiotherapy treatment, I share the concern of many at the withdrawal of hands-on services. Even after getting advice, not everyone is in a position to access online information, and many people need practical demonstrations to ensure that they are doing physiotherapy exercises correctly. My treatment was private as I could afford to pay for it; I can though no longer afford to pay around £40 - £50 for a thirty minute session, and I expect many other people are in the same boat. So, many residents in Rushcliffe who cannot afford to pay for treatment (yes, even in this affluent Borough, there are those struggling with cash flow), knowing that there is no hands-on treatment available on the NHS for them, will probably not do anything, except suffer. Commenting on the new service of advice and guidance instead of hands-on treatment, The Chartered Society of Physiotherapists said, "It is a completely barmy form of treating people". I agree, and I hope that the day will come when the clinical commissioning group will reverse the decision and allow the residents of Rushcliffe to receive hands-on physiotherapy treatment when they need it. Never in our history has there been so much state intervention in individual lives as a form of social control. The present Prime Minister came into office with a pledge to fix "broken Britain". The latest "moral crusade" is to deal with "binge drinking". To do this the Government is proposing a minimum alcohol price of 40 pence per unit of alcohol, and to ban the sale of multi-buy discount deals in supermarkets, to come into effect by 2014. The Government seems to have been persuaded by evidence from crime and health experts, who say that the 40 pence a unit minimum price could mean 50,000 fewer crimes each year and 9,000 fewer alcohol related deaths over the next decade. History does not necessarily back up the alleged promises of such interventions. This is an attempt at a "quick fix solution" to an age old problem, and in addition, it seeks to punish the responsible majority, while trying to address the problems caused by the irresponsible minority. About four years ago, BBC News carried a report on a paper published by Professor Peter Borsay of Aberystwyth University called, "Binge drinking and moral panics: historical parallels?". His paper looked at the "gin craze" of the early 18th Century and the similarities with today. He argued that direct comparisons with drinking behaviour have been over-stretched, saying, "it is not drinking behaviour that merits the comparison, but the moral panics that characterised both periods, fuelled by pressure groups, the media and perceptions of government complacency". In my view we have this moral panic today, and a Government that feels that it has to be seen to be doing something. But what is binge drinking? It's often described as "drinking alcoholic beverages with the primary intention of becoming intoxicated by heavy consumption of alcohol over a short period of time". The problem for me is how 'heavy consumption' is defined. The 1995 Government report called "Sensible Drinking" redefined binge drinking as drinking twice the recommended daily limit in a single session. Martin Cornell in his blog highlights the concern with this type of definition when he says, "Since 'twice the recommended daily limit' could be as low as three or three and a half pints of beer for men and two and a half medium-sized glasses of wine for women, this suddenly put an awful lot of ordinary people's ordinary nights out into the 'binge' category". This is important when you are talking about the scale of the problem, and actually determining how many people are causing issues for the police and health services. It's hard to get accurate, consistent figures and this is why we have such moral panic setting in yet again. Only a small minority of the population, 18% ever binge drink, which means that 82% don't. Can it be right that the 82% get punished for some misdemeanors by the 18%? (Don't forget, not all classified binge drinkers are a drain on the police or health services). 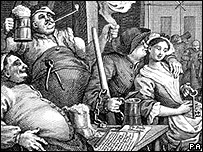 I also think that it's important to remember that binge drinking and anti-social behaviour is not a modern phenomenon; it is steeped in history, and ingrained into the mindset of many. As for supermarket offers, it is worth noting that a South Wales publican in 1836 was offering three drinks for the price of one as an early morning special offer. As for youth drinking, the novelist Daniel Owen in 1891 complained that pubs "were now filled with empty-headed youths, not old enough to shave, drinking like animals and going home in a worse state than any animal". It's also interesting to note that in relation to binge drinking, members of the Ebbw Vale Temperance Society, were allowed in the 1930's two pints of beer a day, similar to the current recommended maximum for men of 3 - 4 units per day. However, problems arose when some members of the Society decided to save up their weekly beer allowance in order to knock back 14 pints at the weekend. Needless to say, the Society soon moved to the view of total abstinence. One final example. In the late 1930's, Tom Harrison wrote "The Pub and the People", in which he refers to the 1854 annual report of the Worktown (Bolton) Temperance Society, which said "That drunkenness is painfully prevalent in the Borough a thousand facts bear most painful testimony. Men and women staggering along the public streets, fights brawls of the most barbarous character". So there is a long history of binge drinking and associated anti-social behaviour, but how is the cause of it described today? It is claimed that people are consuming cheap alcohol purchased in off-licences and supermarkets before going out to pubs and clubs, meaning that they are well on the way to being drunk before they drink further on their night out. I'm sure that this happens, but what is the solution? One thing that I'm sure of is that setting a minimum price for alcohol in the belief (hope) that it will address the problem of binge drinking will not work. The wealthy will just absorb the cost, and the poor will cut back on other things. What makes people think that this will work? Has high taxation and fuel costs driven people off the roads? No. Has escalating tobacco taxes and smoking bans brought about a dramatic decrease in smoking? No. Has bringing in greater punishment for those caught using their mobile phones while driving brought more responsible driving? No. In fact, reports suggest that the use has increased since the legislation became stronger. So why think that alcohol price control will have the desired effect? It won't. So what is the solution? An accurate picture with less drama would help, so that we can understand the level of what we are talking about. There may well be a number of options, and one of those is rarely talked about. One of the sanest comments on this matter that I've read in a long time was to be found in last Monday's edition of the Leicester Mercury. There a retired policeman wrote about pubs and clubs accepting people who had already been drinking in their homes. He said, "Unless the law has changed with the new licensing arrangements, I understand that it is an offence to sell alcohol to someone who is drunk or for someone to purchase alcohol for such a drunken person". From his experience as a policeman, he says, "There is virtually no enforcement of this legislation". David Cameron talks about giving licence holders greater powers, but they're not needed, but even if they were, the current legislation is not enforced, why should we have any confidence that new legislation would be? The local authority responsible for the granting of the licences has the power to revoke or just suspend the licence of premises. To the retired policeman, if premises are visited regularly and action taken against the licensee if alcohol is sold to people who appear to be drunk, the trade would put its house in order. "There would then be no point in drinking before your night out as you would be refused alcohol in the pub or club if sales were prohibited to someone already apparently drunk". If this was operated seriously, there would be fewer drunks on the streets (those who just drink cheap alcohol at home would stay at home), resulting in fewer drunken accidents and assaults, less treatment required in hospital and no need for police officers being required to ensure safety of hospital staff and patients. Isn't this worth a try before using prices as a form of social control? It has the benefit of targeting those who are perceived as being the problem, rather than thrashing those who are not. I agree with our retired policeman. "I find it abhorrent that we are all to be punished because of the lack of enforcement of the existing legislation". Two days ago I journeyed to North Wales to fulfill my sister's last wish; she wanted her ashes to be scattered in a beauty spot not far from where we were brought up, called the Panorama. This was a special place as we were growing up, and as six of us drove up from Penycae for the little ceremony along the narrow, winding road, I marvelled at how many times in our youth, our mother had walked this route with us. When you arrive at the Panorama, you are met with breathtaking views in all directions. To the left you can see extended views to the Shropshire and Cheshire plains; immediately to your right is part of the Eglwyseg Mountain, which is an outcrop of Carboniferous Limestone which stretches from World's End to Trevor. The Panorama road and walk follows this mountain. 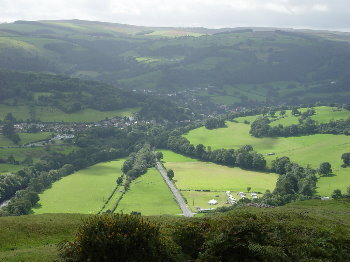 Look down and you see the Vale of Llangollen, with its broad valley floor, which is between 300 and 450 feet below the top of the Eglwyseg Mountain. 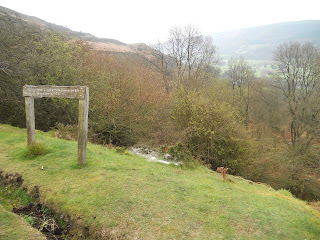 You can see the River Dee, as well as the Llangollen branch of the Shropshire Union Canal. Looking across the valley you can see Ffynon-las-Wood and Tyn Celyn Wood. When looking to your right, you can see the beautiful town of Llangollen nestled in the valley, and high above the town on as isolated hill can be seen Castell Dinas Bran (or Crow Castle). Just out of sight is the remains of the 13th Century Valle Crucis Abbey, which was largely destroyed by Henry V111 during his purge of the Monasteries. A slight hop further along brings you to the famous Horseshoe Pass. It's little wonder that Sue chose this spot for her last resting place. As I stood and gazed across the valley, my mind went back to over 50 years ago and the many times that mum and her two children would walk from Penycae, along the Panorama road, sometimes up the steep hill to Crow Castle (sometimes taking the road around the hill) and down the other side to Llangollen. I'm getting weary just thinking about it. My sister's last wish has now been fulfilled, and after a difficult last twelve months for her, I hope she now has some peace. Though very emotional, it was a joy for me to be back on the Panorama, and in the Llangollen area; who knows whether I might ever see it again. Let me flesh out a few details, so that it explains why this area is so special. 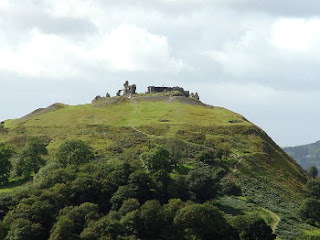 As previously mentioned, Castell Dinas Bran or Crow Castle in English sits high above the town of Llangollen, and is reached by a long and steep climb. It is steeped in myths and legends. It has been said to be the possible burial site of the Holy Grail of the Arthurian legends. It was the 13th Century home of Madoc ap Gruffydd Maelor who founded the nearby Valle Crucis Abbey, and is also believed to be the stronghold of Eliseg, Prince of Powys in the 6th Century. The views of Llangollen and the Dee Valley are stunning. The town has a population of just over 3,000, but every July this swells to over 120,000 visitors as they flock to the world famous Llangollen International Eisteddfod. Many of the surrounding towns and villages play host to competitors from across the world, and my village of Penycae was no exception. 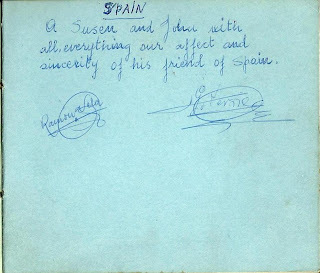 In sorting out my sister's effects, I came across a long lost autograph book of mine from 1958. 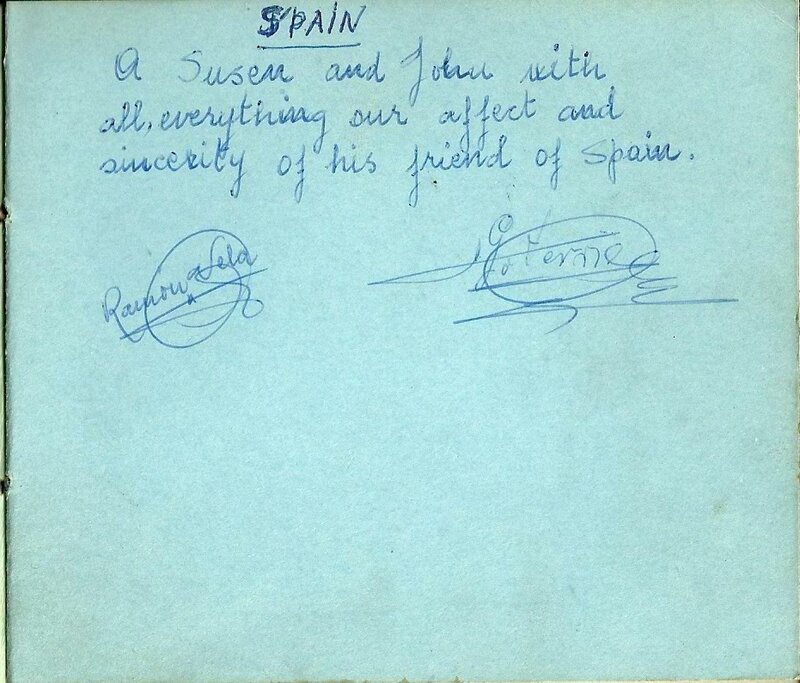 It has a number of signatures and messages from around that period which I'd forgotten all about. It is now part of my treasures. The Railway in Llangollen was opened in 1862, and though it's hard to imagine now, at one time it was possible to board the train at Llangollen Station and travel to London without a single change. Don't anyone tell me that the rail network is an improvement today. The railway was closed to passengers in 1965, and to goods in 1968, and it was seven years before railway enthusiasts could reopen part of the line. Steam trains now operate along part of the Dee Valley, giving a glimpse of what it must have been like to pass through this wonderful scenery in its heyday. Majestically running across the valley floor is the Llangollen Canal. Today, from Llangollen Wharf, you can take a 45-minute horse drawn trip, or a two hour trip on a traditional Canal narrow boat. 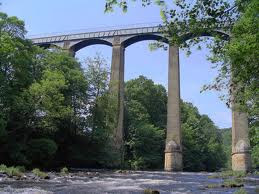 The journey takes you through the Vale of Llangollen and across the longest and highest aqueduct in Britain. Completed by Thomas Telford in 1805, and standing 126 feet above the River Dee, it is undoubtedly a masterpiece of engineering. For over 100 years pleasure boats have been operating from Llangollen Wharf, and they seem to be as popular today as they have ever been. The town, castle, railway and canal all add to the beauty of this part of the world, and help to make the Vale of Llangollen a very special place. Let me finish by going back to where we began - the Panorama. Just a short distance from where we scattered Sue's ashes; up a short path further up on the Eglwyseg Mountain is a monument to the Welsh poet Isaac Daniel Hooson (who was always known as I.D. Hooson). His grandfather was one of a group of lead miners who left Cornwall and settled around Holywell in Flintshire. Later I.D. 's father, Edward moved from Holywell to Rhosllanerchrugog and set up his own grocers and drapery shop in the village. I.D. Hooson was born in Victoria House, Market Street, Rhosllanerchrugog in 1880, and lived in the same house until his death in 1948. He was a solicitor, and from 1920 to 1943 was Official Receiver in Bankruptcy in the Chester and North Wales area. He was a patron of Urdd Gobaith Cymru (which translates as "Welsh League of Youth", and is Wales' largest youth organisation, with over 50,000 members today). He was also a member of the council of the National Eisteddfod. In 2007 a new Welsh school was opened in Rhosllanerchrugog and called in his honour, "Ysgol ID Hooson". He was a very proud Welshman. Undoubtedly he is best remembered for his poetry, though as I don't speak Welsh, I haven't had the joy of reading it, but have had to rely on the comments of others. He is recognised as one of Wales' premier poets. During his lifetime he published only one collection: "Cerddi a Baledi" in 1936, but a second collection, "Y Gwin a Cherddi Eraill" was published shortly after his death in 1948. Those that know his works reckon that he is best known for his poems written for children. I.D. Hooson is looking down over where Sue's ashes were scattered, so she has good company on the Panorama, and you can't ask for much more than that in life or in death, can you? I don't own a car. I can't afford one, and quite frankly I don't need one. Where I live, public transport is perfectly adequate for my daily needs. If there's something really special that I need to do away from my area, then I hire a car. This is cost effective, and only happens two or three times a year. This weekend is one of those occasions. 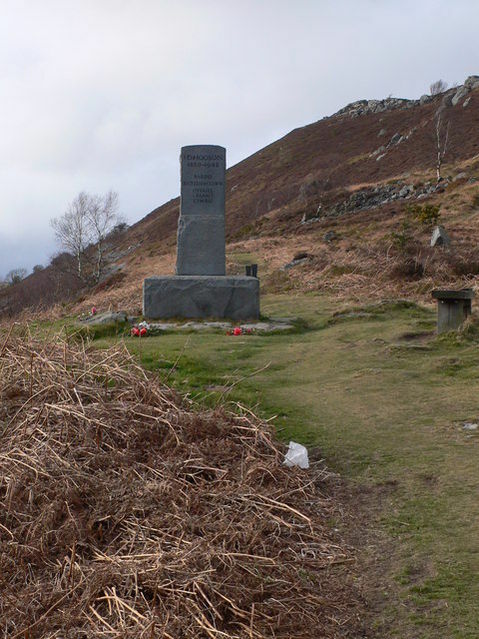 I picked up a rental car this morning for a four day hire, so that I could collect my sister's ashes from Lichfield, and take them up to Wales over the weekend to scatter them, according to her wishes, in a well loved beauty spot. So far so good. 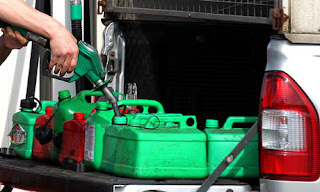 I began to worry a little bit when on my way to the car hire place I saw a Nottingham Post headline outside a newsagents which said, "Notts petrol stations run out of fuel as panic hits the forecourts". What on earth was going on? The car had about a quarter tank of fuel, so I obviously needed to get some more. In touring around (wasting valuable fuel), Sainsbury's and Tesco's had run out, one or two smaller garages were restricting customers to a maximum of £5 of fuel, and those garages (for example Asda) who seemed to still have an adequate supply also had horrendous queues waiting to get in. I decided to make my way to Lichfield in the hope that everywhere wasn't as mad as Nottingham. At the Donington Park Services there was plenty of petrol, and no queues, but of course the price is exorbitant. Beggars can't be choosers, and I filled up, then made my way to Lichfield. Tomorrow I will have enough to get up to Wales which will allow me to do what I have to do. I'll worry about getting back on Monday. Why on earth was all of this so difficult? So why the panic? The Government has not helped here. One Minister, Francis Maude gave the advice that people should fill jerry cans with petrol to prepare for a fuel tanker strike. This has caused apoplexy in the Fire Brigades Union, who have warned that it would "massively increase" the risk of fires and explosions. The maximum that you can legally store in appropriate containers is 30 litres, and these must not be in domestic dwellings or buildings attached to domestic dwellings. So people without a garage, or have one attached to the house are in trouble. David Cameron has distanced himself from Maude's advice, but has said that it is "sensible" to keep the car topped up. Neither men are being particularly helpful here. But there's something else. In yesterday's Telegraph newspaper, Dan Hodges had an article with the headline, "Petrol panic: it's hard to tell who's stupider, the Government of the governed". And he goes on to say, "If you filled up your car today because Francis Maude told you to, you're an idiot. Sorry to be so blunt about it, but you are. In fact, anyone who has taken any action over the past seven days on the advice of ministers in this Government needs their head examining. Don't get me wrong. Francis Maude - acting like Corporal Jones after a posting to the Desert Rats, with his order not to panic, but break out the jerry cans just in case - is an idiot too. But seriously; if he went on television tonight and told you to put your hand in the fire, would you?" I agree with Dan Hodges. Do other nations panic as easily as the British? Are others as daft, as when we see a queue we must join it? We don't even know yet that there is going to be a strike, but even if there is, why panic now? There's time. Oh to heed the words of AA President Edmund King , who said two days ago, "It's vital that people do not turn a rumour into a crisis". But I guess that too many people actually love a crisis. Yesterday, the Queen, as part of her Jubilee Celebrations addressed members of both houses of Parliament at Westminster Hall. It was of course covered by the BBC, and I watched the first half hour of the programme, but switched off before the speeches, for reasons that will become evident. What a marvellous building this is. 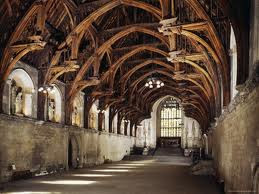 To quote from the Westminster web site, "Westminster Hall is the oldest building on the Parliamentary estate. What makes it such an astonishing building is not simply its great size and the magnificence of its roof, but its central role in British history. Closely involved in the life of the nation since the 11th Century, a journey through the Hall's past is a journey through 900 fascinating years of our history". While I marvelled at the magnificence of the Hall, what was going on under its awesome ceiling filled me with nausea. You see, I don't believe in a monarchy, and never have, though I do remember once, in support of the organisation I worked for attending a Royal Garden Party at Hillsborough Castle in Northern Ireland. I did escape a line that was waiting to shake hands, as that would have been too much, but I must say that the strawberries were wonderful, but as it was the season for them, they would have been great anywhere. I'm not an aggressive anti-monarchist, or a rabid republican: neither to I want to reintroduce the guillotine, imprison royalty or banish them to some far off island. It's the institution that I object to not the personalities. I'm sure that the Queen is very nice, and that Prince Philip, in spite of the occasional blunders is no worse than anyone else. The reason why I am not a monarchist is because I believe in the equality of man. (I use man in the generic sense to denote man and woman). You cannot have equality when you are described as "My loyal subjects". If you are a subject then you are inferior to the person you are subject to. Superiority or inferiority have no place in the equality of man. 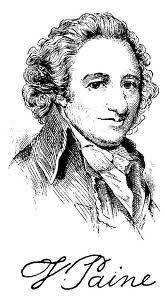 I'm currently reading "The Works of Thomas Paine" - and this man could write. Though born to a Quaker family in Thetford, Norfolk in 1737, he went to live in Philadelphia around 1774, where he began a new career as a journalist. In 1776 he published a short pamphlet (though the definition of a short pamphlet in the 18th Century is very different from that of today) called "Common Sense". He quickly gained a reputation as a revolutionary propagandist. As one of his biographers said, "He attacked monarchical government and the alleged virtues of the British constitution, opposing any reconciliation with Great Britain. He also urged an immediate declaration of independence and the establishment of a republican constitution". He rested his case on the moral basis of the natural equality of men (in the sight of God). The statement about natural equality is true whether you are religious or not. If religious, then we are all created equal; if not religious then we are all born equal. In the same year as Paine published his pamphlet, Thomas Jefferson was responsible for writing the United States Declaration of Independence, which declares, "We hold these truths to be self-evident, that all men are created equal". Eighty seven years later, Abraham Lincoln in his famous Gettysburg Address, referring to the Declaration of Independence, opened with "Four score and seven years ago our fathers brought forth on this continent a new nation, conceived in liberty and dedicated to the proposition that all men are created equal". There have been those who have pointed out that this equality was fine as long as you're not black or a native American Indian. This comment has not been made with the benefit of hind sight, as in the year that the Declaration was written, the abolitionist Thomas Day said about its hypocrisy, "If there be an object truly ridiculous in nature, it is an American patriot, signing resolutions of independency with the one hand, and with the other brandishing a whip over his affrighted slaves". One hundred and eighty seven years later in 1963, Martin Luther King Jr was still waiting for this equality, when in his famous 'I have a dream' speech, he said, "I have a dream that one day this nation will rise up and live out the true meaning of its creed: We hold these truths to be self-evident; that all men are created equal". The fact that men are imperfect, and have imperfectly followed through on this equality does not negate the belief that all men are born equal, and remain equal. Monarchy is incompatible with equality. Monarchy says that some are better than others, that the majority should be subservient to the minority, that the few should be fawned over by the many. The equality of man does not allow for subservience; for fawning obedience; for bowing or scraping; for allegiance. Socialism believes in the equality of man, and therefore I don't believe that a Socialist can also be a Monarchist. In Tony Benn's blog of June 2002, at the time of the last Jubilee, he wrote, "In Royal Britain we are expected to confine our loyalty to someone at the top rather than express it in solidarity with our fellow men and women, and this is the basis of the feudal class system within which our duty is to those put above us, know our place and keep it out of respect for our betters. The feudal class system is still a very powerful force in Britain, but it has nothing whatsoever to do with the socialist definition of class which identifies very different economic interest between those who work to create the nation's wealth and the handful at the top who own that wealth". He also said in a Guardian article in 2003, "Above all, the existence of a hereditary monarchy helps to prop up all the privilege and patronage that corrupts our society; that is why the crown is seen as being of such importance to those who run the country - or enjoy the privileges it affords". The equality of man is not just some fancy philosophical statement; it has to be seen to work out in practice. As far as I'm concerned, Monarchy has no place in a modern, so-called democracy, because there is no equality of man with it in place. The alternative to monarchy is an elected First Citizen who would be fully accountable to the Parliament that we also elect. Was this what Lincoln was saying in his Gettysburg address, when he concluded with the words, "... that this nation shall have a new birth of freedom, and that government of the people, by the people, for the people, shall not perish from the earth". But that's for another discussion. At the last Jubilee in 2002, Tony Benn wrote words that are still relevant. "The Jubilee has provided them (the people at the top) with a marvellous opportunity to put the clock back more than a hundred years by providing bread and circuses for the peasants and allowing the powerful to celebrate their new found sense of security". I've tried to be reasoned and reasonable here; avoiding personal criticism of the present royalty, as it is the issue of monarchy and not the personalities that is important. Let me leave the final word with the Monarchy, in the shape of Prince Charles. "Something as curious as the Monarchy won't survive unless you take account of people's attitudes. After all, if people don't want it, they won't have it". Well I for one don't want it, as it is an affront to the equality of man.